Sarah Jane is a Senior Grants Manager (job-share), taking the lead on our Access and Participation in the Arts work. Sarah Jane has more than 14 years’ experience working in the arts sector. Since joining PHF in 2006 as a grants officer, she has managed a mixed portfolio of grants that includes visual arts, music, theatre, literature and poetry. Sarah Jane has also been managing Paul Hamlyn Foundation’s Awards for Artists scheme, which provides individual support for Visual Artists and Composers. She previously worked as Visual Arts Co-ordinator for the Liverpool Culture Company, held posts in the development departments of Liverpool Biennial and Open Eye Gallery, was Internship Co-ordinator at the Peggy Guggenheim Collection, Venice and Project Manager for the American Pavilion at the 50th Venice Biennale. 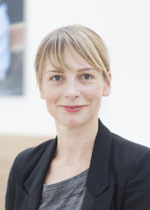 A graduate of fine art, Sarah Jane also holds an MA in European Cultural Policy from the University of Warwick.